Join the library in celebrating National Poetry Month. Find the Poem Boards on the 2nd Floor Walkway and Post Your Own Favorite! Join the library in celebrating National Poetry Month! 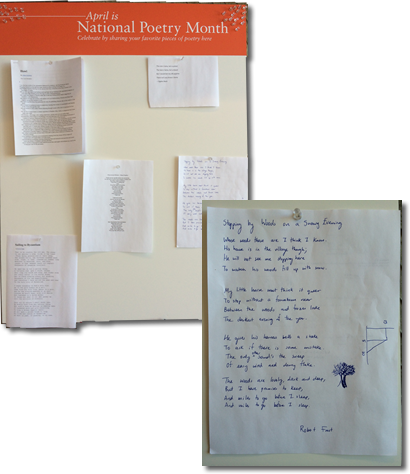 Look for the poem boards on 2nd Floor walkway across from Library 206 in the midst of the Richard and Cecila Ward Poetry Collection. Read what your friends and classmates may have put up there. And don’t forget to bring your own favorite to hang up! This entry was posted in Claire T. Carney Library Associates, From the Dean of Library Services on April 10, 2014 by cmcneil.